Carolina Resource Corp. (“CRC”) continues their strategy of investing in new equipment and technology to support increasing requirements of its customers. 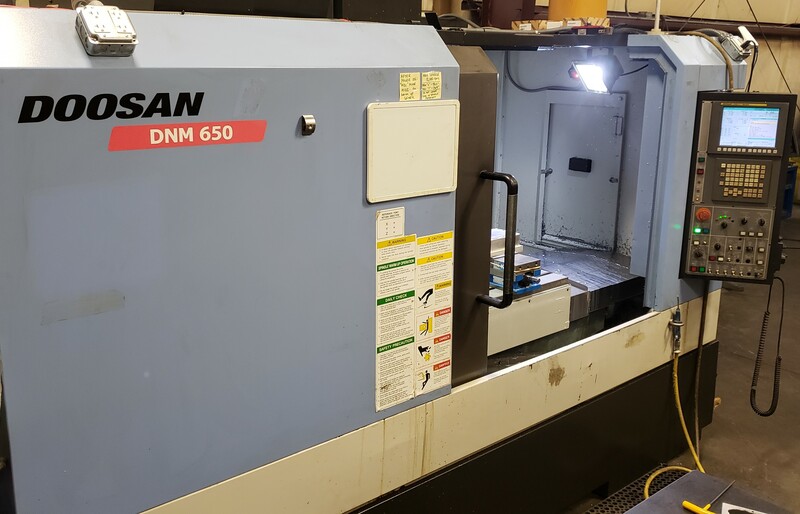 CRC has placed a Doosan DNM 650 Large High Speed Vertical Machining Center on their production floor. “Our investment in a Doosan DNM650 Large High Speed Vertical Machines shows our commitment quality and competitiveness.” says Shawn Stecker, CRC Chief Executive Officer. “The larger machining area of 50 x 26 allows us to produce larger parts without moving to reach all features .” Mr. Stecker added. Renishaw Tool Probing allows CRC to automate in process checks and adjust for tool wear or breakage, while automated part probing confirms in process actual machined dimensions. The Renishaw Part Probe allows us to adjust our datum point on large castings, weldments, and raw stock material differences on a per part basis. The minor dimensional tolerances, squareness, and how the part is loaded differently each time is compensated for using the accuracy of the machine. Based out of Youngsville North Carolina and located closely to the Raleigh, Durham, Chapel Hill areas, Carolina Resource Corp. provides Contract Manufacturing and Design to Manufacture services to the Aerospace, Automotive, Medical, Consumer, Recreational Sports, Work Holding, Food Service, Environmental, and Naval Industries. Carolina Resource Corporation has been awarded their ISO 9001:2015 Certification for 7th Year in a row. Carolina Resource Boasts Stellar Customer Service, Providing Contract Manufacturing and Design to Manufacture of Aerospace, Medical, Automotive, Environmental, Consumer, Marine, and Recreational Products. Carolina Resource Corporation proudly holds our ISO Certification confirming that we have met global company standards and adhere to the most stringent company requirements to best serve our customers. Based out of Youngsville North Carolina and located closely to the Raleigh, Durham, Chapel Hill areas, Carolina Resource Corp. provides Contract Manufacturing and Design to Manufacture services to the Aerospace, Automotive, Medical, Consumer, Recreational Sports, Work Holding, Food Service, Environmental, and Marine Industries. We help clients take ideas from a cnc machined prototype part to full production of assemblies.